What happened to Teen Wolf's Scott Howard (Michael J. Fox) after he left high school and transitioned into adulthood as a dude who has the ability to transform into a wolf? Unfortunately we never found out -- and Jason Bateman's bland Teen Wolf follow-up didn't provide us with those answers. So we waited, forever curious about Howard's ongoing adventures as half man, half wolf. Would it interfere with college? How about getting a job? Would a woman even marry him knowing her kids could end up as wolf kids? MTV attempted to bring back Teen Wolf, except it was all serious and Twilight-y, making it clear from the start that lifetime members of the Scott Howard fan club (myself included) weren't welcome. But finally -- finally! 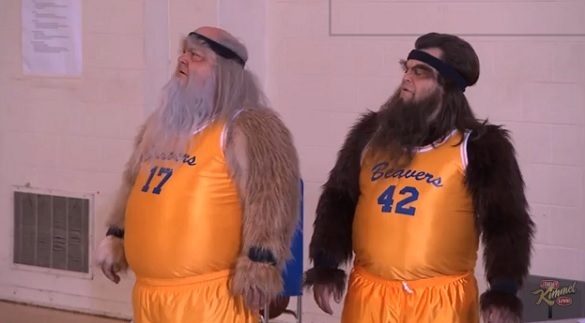 -- all these years later, here come Tenacious D members Jack Black and Kyle Gass with a new version of Teen Wolf that continues the Scott Howard story in spectacular fashion. Okay, maybe not that spectacular -- and maybe this is just a spoof video at the end of the day -- but it's definitely the closest thing we'll ever get to a true Teen Wolf sequel that mixes the dorky humor of the first one with contemporary issues, like the fact that Howard (Black) and his wolf father (Gass) might be outcasts, forced to live in a trailer park. When a menacing neighbor (played by John C. McGinley) makes them feel bad about who they really are, our two wolves set out to earn enough money in a father-son basketball tournament in order to get a full-body wax. Ed Begley Jr., Rachel Bilson and Washington Wizards star John Wall also make appearances. Adult Wolf... coming this summer (in our dreams). Watch it below.